Twitter head Jack Dorsey has said that his company does not act on political biases. Even while recently testifying in front of Congress he denied such activity on his part or the part of his employees. But another instance of seeming political bias has cropped up, and this time, it’s causing a tremor in the “force” of Twitter. What’s the big deal? He posted a curious thing, mentioned that it’s probably fake, but drew on the socio-political currents to observe that this kind of anti-male mindset is prevalent among Dems. Well, Twitter didn’t like it, and decided to go after him. Claiming that he posted something containing “text and imagery that has the potential to be misleading in a way that could impact an election” and that this was against their rules. His account is locked until he removes the offending Tweet. But Woods is not one to be bent like a plastic flower. In an interview conducted Sunday, September 23, he told the Associated Press that he will not remove the Tweet. The irony is, Twitter accused me of affecting the political process, when, in fact, their banning of me is the truly egregious interference… Because now, having your voice smothered is much more disturbing than having your vocal chords slit. If you want to kill my free speech, man up and slit my throat with a knife, don’t smother me with a pillow. And it will leave folks interested in honest opinions lacking, regardless of whether they agree or disagree with him often, rarely, or not at all. To think that a Tweet that actually contains an acknowledgment that it’s probably a parody could be misconstrued by the Twit-heads in charge is pretty stunning. But, given Mr. Woods’ reach, especially just prior to the mid-term elections, it allows one to come to a few reasonable conclusions. Perhaps, just perhaps, the Twit-meisters were intent on shutting him down for any reason, and, as absurd as their reason here, this was the lever they decided to use. 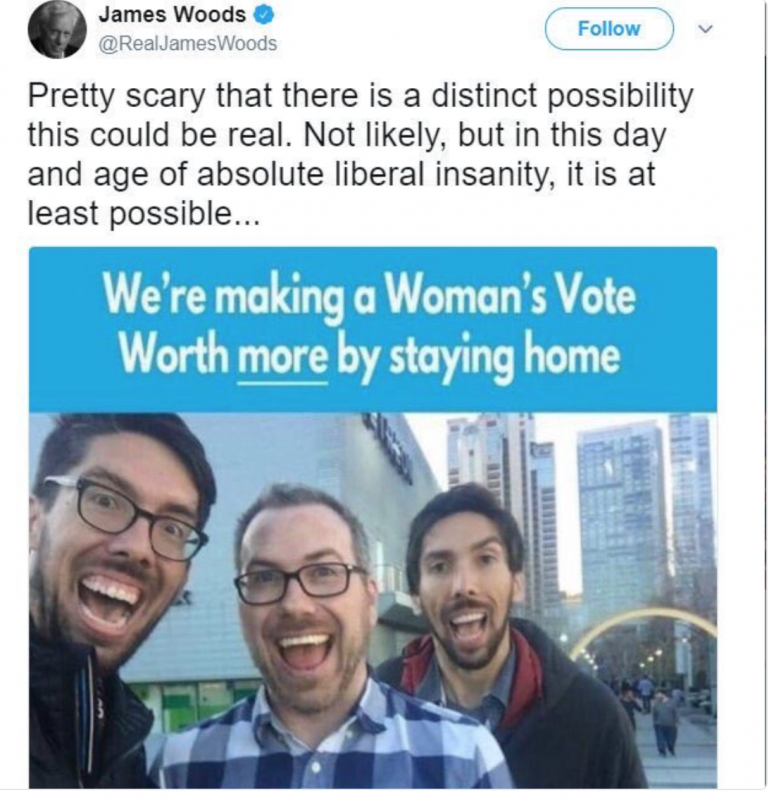 James Woods seems to be of a similar opinion, and he makes a good point about the arbitrariness of the Twit-crowd decision. He noted that his original tweet was reposted by his girlfriend on Friday and had been retweeted at least 12,000 times by Sunday. His girlfriend’s account wasn’t locked, which he said was proof that he’d been singled out because of his large Twitter following. Yep. With a following of 1.7 million seeing his consistently witty, right-leaning messages, perhaps the left-leaning Dorsey and co decided to muzzle him prior to the election, while others who don’t have the same reach, but who retweeted the same image, have been left alone. These kinds of stunts by Twitter are common. These “unbiased” folks seem to be very strict about “standards” (even standards that don’t really apply, such as the case of Woods’ clearly satirical post) when it comes to conservatives, libertarians, and anti-war voluntaryists, yet they allow clearly, obviously, intentionally hate-filled posts to remain, and their issuers to stick around. PJW also correctly noted that Peter Fonda, who Tweeted his desire to see Barron Trump locked in a cage with pedophiles, was never bothered by Jack Dorsey and his gang. So maybe, just maybe, Twitter CEO Dorsey’s statements don’t match the actions of his corporation. Perhaps that is why so many people have migrated to Gab as a free alternative. Perhaps that’s why we who aren’t collectivists have noticed this bias for a long time. Perhaps that's why Twitter, which used to get away with calling itself a "platform" that didn't "edit" content -- and, as a result, it got to avoid libel and slander laws -- can no longer call itself that. It is clearly culling content. As Woods tells the AP, people are being stifled. I wish this were about an unknown Twitter user so that I could be even more passionate about it… This is not about a celebrity being muzzled. This is about an American being silenced — one tweet at a time.